Moshe Cohen is brilliant. Yesterday, I was privileged enough to take a seminar with 50 other females called “Negotiating for Women.” Although Moshe focused primarily on negotiating salary (do you know the average female makes about $4,000 less than the average male obtaining the same position? I’m pissed too! ), many of the principles he discussed applies to blushing brides as well. 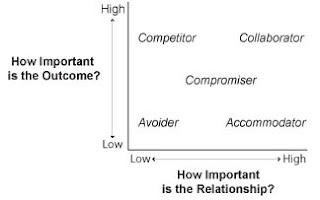 Broadly speaking, the competitor values the outcome a lot and the relationship a little; the accommodator values the relationship a lot and the relationship a little; the avoider hates negotiating altogether; the compromiser looks for fairness and equality as defined as both parties giving something up; the collaborator looks for solutions outside of the box that satisfy both the negotiator’s and the opponents needs. Moshe’s first step for negotiating success says for you to identify which type of negotiator you are. Where do you fall on the scale? The next step to successful negotiation is walking into a meeting informed. So let’s say you walk into a meeting with your DJ. Moshe would suggest that you know how much the competing DJ company’s are charging brides for similar services. He would also suggest that you know about the DJ him/herself…does he/she have children? Is this his/her second job? You can gather this information by doing something that, Moshe says, women do inherently better than men…listen. It’s a good thing because people like brides who listen, making them more willing to negotiate with us. Other resources to assist you in research include website reviews, bridal forums, and even your network of friends who are recently married. Don’t let the fear of asking make you not ask. Moshe informed us there is a pleasant way to phrase tough questions to seem non-threatening. For example, let’s say a florist hands you a paper with their prices that are $500 over your flower budget. Instead of saying “this is too much for me – you need to lower the price” you can say something to the effect of “I’ve heard from other brides that they pay about $500 less for those hydrangeas. Is this negotiable?” You haven’t made any brutal demands, making the florist more likely to engage in a conversation with you. Moshe warned that we should not answer this cold…make sure you do your research. Bridal Wit Takeaway: Just like business professional women can negotiate for salary, brides can negotiate for what they want too. First steps for improving your business-savvy bridal negotiating skills are identifying your style, doing your research, and not being afraid to ask. Have a story? Share it hear. It would be good to see how these principles may have worked for you. Like this blog? Become a fan. Enjoyed the post? +1 it. Share on Facebook, Twitter, etc.